The International Relations Program (IRO) at Otero Junior College is set to hold their fourth Lunch and Learn presentation on Thursday, Jan. 24 from 12:15 p.m. – 12:50 p.m. The Lunch and Learn Presentation will take place in OJC’s Learning Commons located in Wheeler Hall. The presentation is free; however, lunch is not provided. Attendees are welcome to purchase lunch at the Starbuck’s Venom Pit Coffee Shop or bring something to enjoy. According to Melanie Culver, IRO activities coordinator, all community members, OJC staff, and students are invited to attend. “The IRO Lunch and Learns are great for learning about different cultures and sharing cultural norms and traditions,” said Culver. The IRO is opening up the spring International Lunch and Learn series featuring the nation of Croatia, presented by Ema Causevic. Causevic explained that while she is a Croatian native she spends a good part of the year with family in Italy. 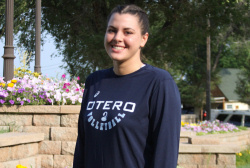 She transferred to OJC this past fall semester to join the Lady Rattler Volleyball team. “In addition to being a great hitter for the team, she is also a stellar artist and wants to work in graphic design.” Chellie Wallace, director of IRO, explained. International Lunch and Learns were established to provide an introduction to the cultures that make up the student community by featuring students from different corners of the globe. At this monthly program, students share unique information about their countries, and the audience gets the inside track about those countries, cultures and special places. The Lunch and Learn program is sponsored by the IRO and the OJC Learning Commons. There are Lunch and Learn presentations scheduled for the rest of the academic year. To stay up to date on when the Lunch and Learn presentations are, visit www.ojc.edu and view the events calendar located on the homepage of the website. All presentations are free and open to the public. If you can’t make it, but are interested in learning more, check out the video at https://www.facebook.com/OJCInternationalRelations. For questions regarding the Lunch and Learn, or the IRO, contact IRO Activities Coordinator Melanie Culver at 719-384-6804. The International Relations Program (IRO) at Otero Junior College is set to hold their fourth Lunch and Learn presentation on Thursday, Jan. 24 from 12:15 p.m. – 12:50 p.m. The Lunch and Learn Presentation will take place in OJC’s Learning Commons located in Wheeler Hall.